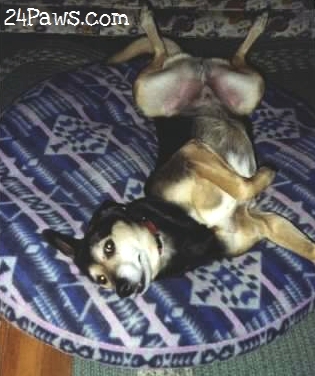 Two years ago today, we said goodbye to the last member of our dog pack. Sweet Grandbury, I miss you every day. We said goodbye to Grandbury March 24, 2012. He was amazing. It has been two weeks, and I’m still unable to write anything past this announcement. It is too soon, and we are too raw. 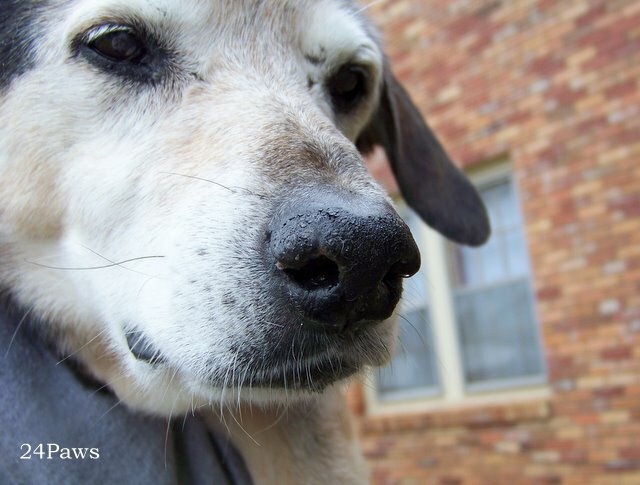 Check out Grandbury’s nose after just three days of using Snout Soother! Looking pretty good, eh? If you don’t remember where his poor nose started from, check out the previous post. Even the neighbor horse stopped to take note of the progress. We’ll keep you posted, but so far, so very good. 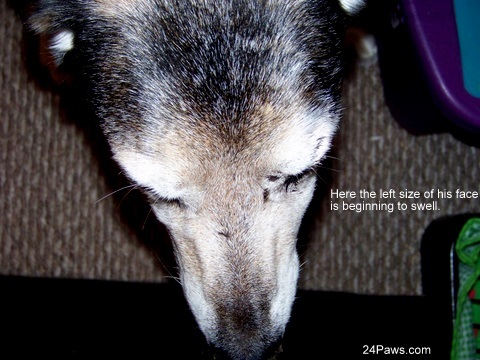 This is the quickest we’ve seen results like this with any product we’ve tried on his old dog nose. We apply three times a day, morning, afternoon, and night. A little goes a long way. 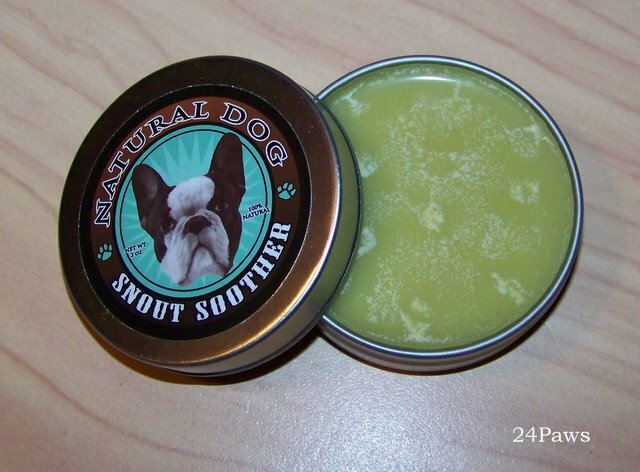 Some points we really love about Snout Soother by Natural Dog Company. Virtually odorless – Grandbury doesn’t have a care in the world when we apply it to his nose. Non-toxic and all natural – Love the all natural ingredients! Vegan – While we are vegan and Grandbury isn’t, we love the fact that this is a compassionate product and are grateful that no other animal has to suffer for its creation. Portable – The tin the Snout Soother is packaged in means that we can pop it in a bag and take it with us on the go, and you know that Grandbury definitely goes! We are definitely seeing some great results, and we will keep you posted. Get outside with a Play Pack! While cutting veggies for soup, I gave Grandbury a few slices of carrot. He devoured them and went on his merry way. Later, while brushing his teeth, I noticed he had bit the inside of his left cheek. His gumline was irritated from the carrots, which is normal these days since he no longer receives hard chews. However, I noticed he didn’t want the gum above his 4th premolar (Carnassial tooth) area touched. He was fine with me touching the actual tooth. He didn’t react when I pushed upward on the tooth. His sensitive reaction was limited to one tiny spot on the gum. Later, I noticed his face had swollen a little more and I once again checked out his mouth. Nothing had changed. It almost appeared that he had been stung by something, so I gave him 1cc of Children’s (no alcohol) liquid Benadryl. 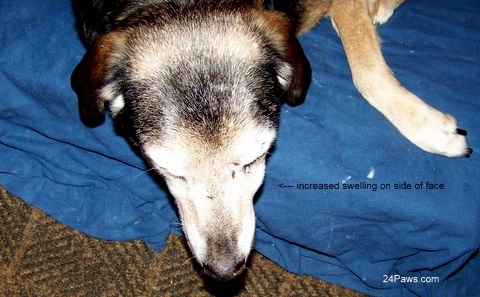 The Benadryl had no effect on the swelling. Grandbury’s face was still swollen. He ate and drank regularly. Appears fine except he doesn’t want the gum above the carnassial tooth touched. When I brushed his teeth that evening I felt a lump, hard and circular at the meeting of the cheek and the gum line. This appears to be where the pain is radiating from. Still eating and drinking regularly. Checked spot upon waking in the morning. Larger. Still swollen. By mid-afternoon/early evening redness has expanded on lip area and gum. He is drinking a lot of water. 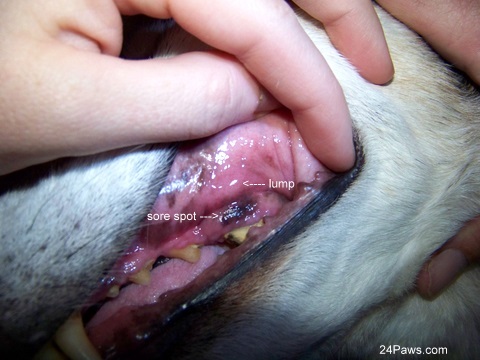 The “lump” has now become more of an ulcer, extending over the gum, the gum above tooth now has a soft, very tender and swollen area. He is obviously experiencing pressure and pain buildup. 8:00 pm Grandbury is heavily panting and pacing. 12:45 am finally resting comfortably. 2:12 am resting, took photo to document very red and swollen areas. 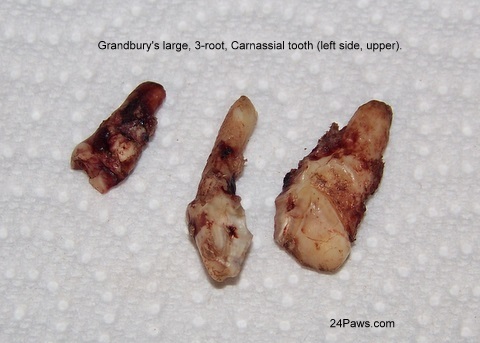 To us it looks like a tooth abscess, but for Grandbury’s sake, we certainly hope it isn’t. As Grandbury wakes up and we prepare to take him in to the vet, I snap this photo to show the increased swelling of his face.Visible outward signs of what lies beneath. 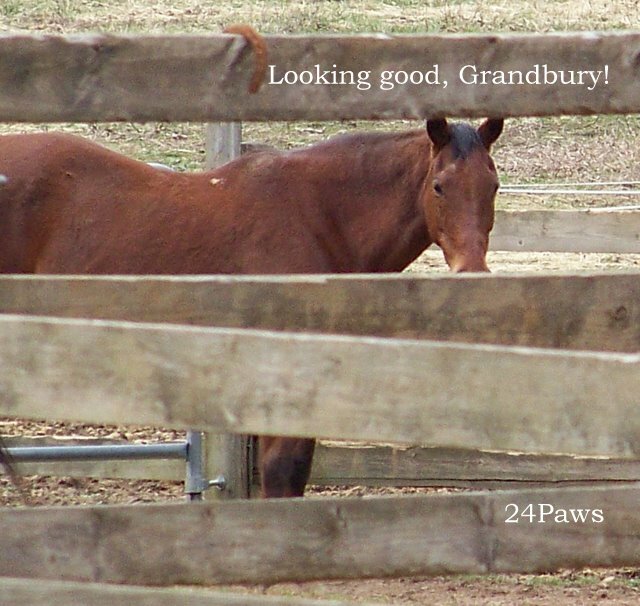 Grandbury definitely wondered why he was up and out with no food. Anticipating there might be surgery, we didn’t allow him any food, only water. 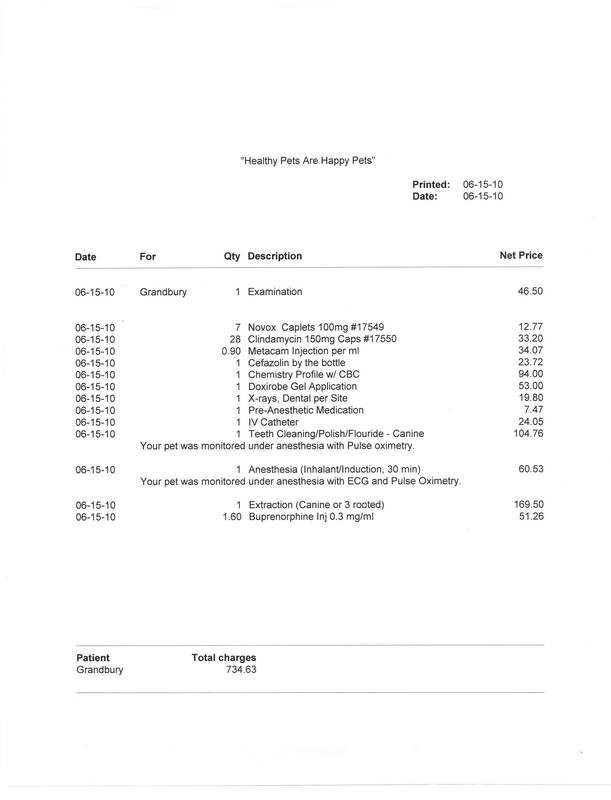 We provided the photos and notes we’d taken to the vet. It has been our experience, that the more information you can provide, the better off you and your pet will be. The rapid change in his status was visible. Even if you don’t take photos, try to get in the habit of making notes. 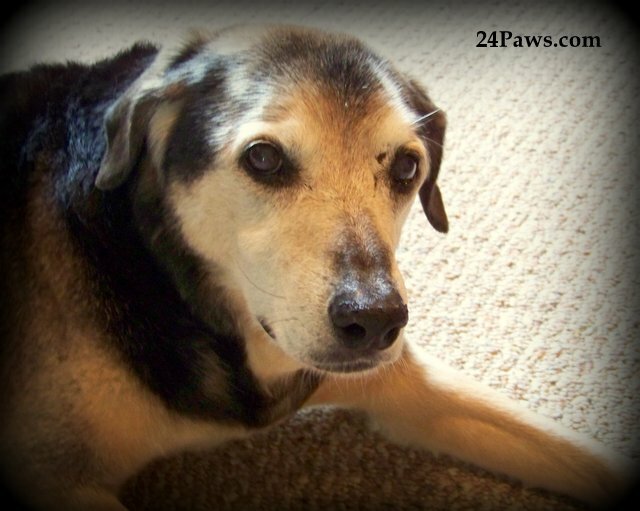 You’ll be surprised what you forget when you are standing in the vet’s office, as you attempt to keep your pet calm and run down a list of symptoms while answering questions about when you first noticed this or that. The vet believed it was an abscess. The plan was to x-ray his teeth, and since he has to have anesthesia for that, if the x-ray proved positive for an abscess, move him into surgery. No point in getting anesthesia twice. We were already up half the night worrying about the potential risk to him for anesthesia, any required surgery, and healing. Sixteen years old is not an age to start taking risks. We lost one of our girls, a precious ferret, during a surgical procedure. Losing a beloved companion due to a surgical error never leaves you. Our guys have had many surgeries over the years. We’ve weighed every conceivable risk and benefit before giving the green light to the procedure. It is a decision that we never enter into lightly. No matter how many surgeries we have under our collars, each presents its own problems and fears from the surgical procedure to the post operative care. While he had blood work done just one month prior, a new panel had to be done to make certain that he was okay for surgery. We needed to know that he would be able to metabolize the anesthesia and that no other surprises were lurking. 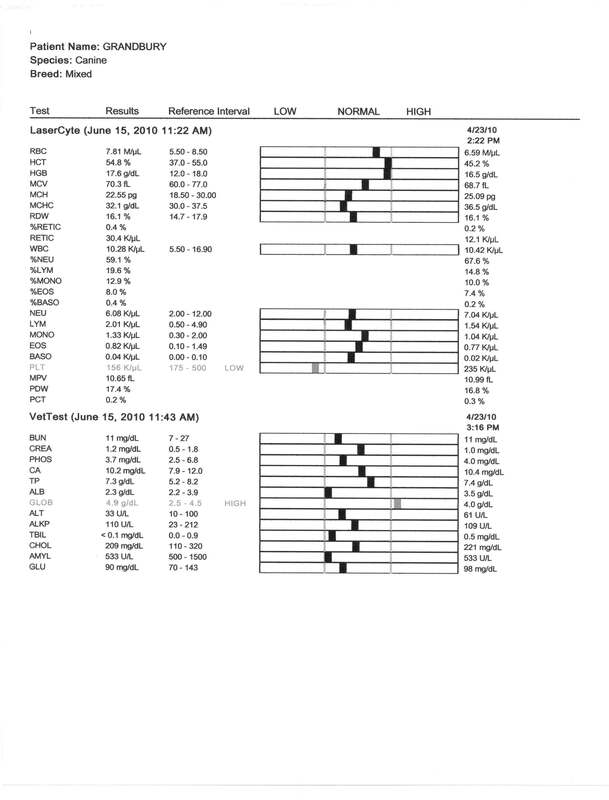 Blood work came back great. Pretty amazingly in fact, for a 16 year old with a 7″ round tumor on his side (we’ll get to that in another post). So, operation “remove the abscess” had begun. 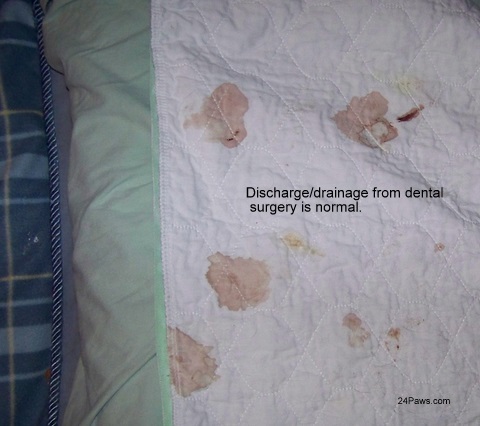 The whole procedure, from the time he was given a pre-anesthesia, to the time his tooth was pulled and he was in recovery, was approximately 90 minutes. He was monitored as he woke up from the surgery. Total time at vet’s office: 10:00 am – 4:30 pm. A long day for him and us. Here is the nasty tooth that caused so much ($734.63) trouble. He came home and slept and slept. He also had a good deal of drainage, but the underpads save the day again! They made clean up a snap, and saved a lot of washing of beds and coverlets. Once you have these things, you’ll find 101 uses for them. Grandbury pulled through the surgery and the post-op care like a champ. At first he was very reluctant to eat even his favorite soft treat: canned pumpkin. A lot of coaxing and some syringe feedings were required for the first three days of his healing. It was very important for him to have some food on his stomach due to the pain medications he was on. We are relieved that he is still with us, and came through the surgery like a champ. It was a scary idea for us, and thankfully, this time it worked out in his favor.